Author Caroline Lawrence returns to the Wild West with another action-packed mystery starring Master-of-Disguise, P.K. Pinkerton. After vanquishing three notorious Desperados, twelve-year-old P.K. Pinkerton opens a private-eye business in Virginia City. P.K. 's skills are quickly put to the test: When a maid named Martha witnesses a murder, she hires the young detective to track the killer before he finds her too. P.K. enlists a trusted ally, Poker Face Jace, to help crack the case—but collecting clues and keeping Martha safe will not be easy. Cunning liars, rogue gunslingers and deadly foes lurk at every turn, and time is running out to bring the murderer to justice. Sharp, thrilling and vividly imagined, P.K. Pinkerton's second action-packed adventure will keep your heart racing through the very last page. P.K. 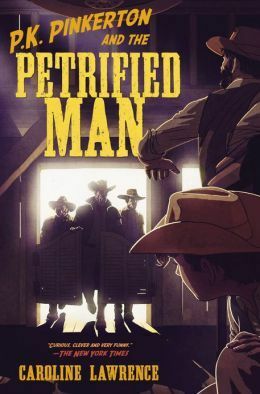 Pinkerton and the Petrified Man by Caroline Lawrence is the third middle grade book in the P.K. Pinkerton Mysteries series. I did not read the previous two (The Case of the Deadly Desperados - #1 and The Case of the Good Looking Corpse - #2). These books are westerns, set in the mid-1800s. I will say that I had a hard time staying interested in this book, but I'm not big on westerns to begin with. I think the average middle grader will completely devour this book (and the rest of the series)! P.K. Pinkerton is a 12-year old boy who dreams of becoming a detective at his uncle Allan's detective agency in Chicago, so he's getting some work under his belt now. With the death of his parents, he sets up his very own detective agency in Virginia City - it's first! He quickly gets his first real case from Martha, Short Sally Sampson's lady-maid, and it's to find her killer before he finds her! This story is very intriguing; told entirely from P.K. 's point of view. Having killed the Chief of the Desperados, he's not the most popular person in town. He enlists the help of his friend, Poker Face Jace, in his quest to find the Killer. P.K. searches everywhere he can think of, and just when you think he's at the bottom, he just may surprise you. This book is definitely fast-paced and thrilling (as thrilling as middle-grade books go) and I think kids will have a wonderful time pretending that they're a detective right along with P.K. I think the best thing about this book is the characters. (Again, my hard time reading was because of the "western" theme.) The characters were definitely interesting and I found myself instantly attached to P.K.